More coverage of security topics for your web services. Test 7 is today. We’ll probably do that closer to the end of the class/session. Example answers will be posted within hours. In the web apps programming courses, you learned how to embed security functionality in a web app. In addition, your initial study of security functionality in a web service project enabled you to conclude that it looked similar to that in a web app. The problem here is that an app is tied to its security components. If you wanted to create a second app with security, then the second app had its own security components, and could not share credentials and so on. How do you fix this? By separating the security components from the apps. In Lab 7, you are implementing this fix. Let’s learn more about security functionality. While there’s a long list of security definitions and terms (presented formally in a later section), the text below introduces the vitally-important foundational items. ASP.NET Identity includes identity management components. These enable the creation, storage, and management of user accounts. The IdentityModels.cs source code file includes a data context class that inherits from IdentityDbContext<TUser>. When the database is accessed for the first time, the Entity Framework infrastructure creates a number of tables in the database which support identity management. All of the tables begin with the prefix “AspNet”. If we were to look at a diagram of the classes that are represented in the data store, it would look like the following. Click to open full-size in its own tab/window. 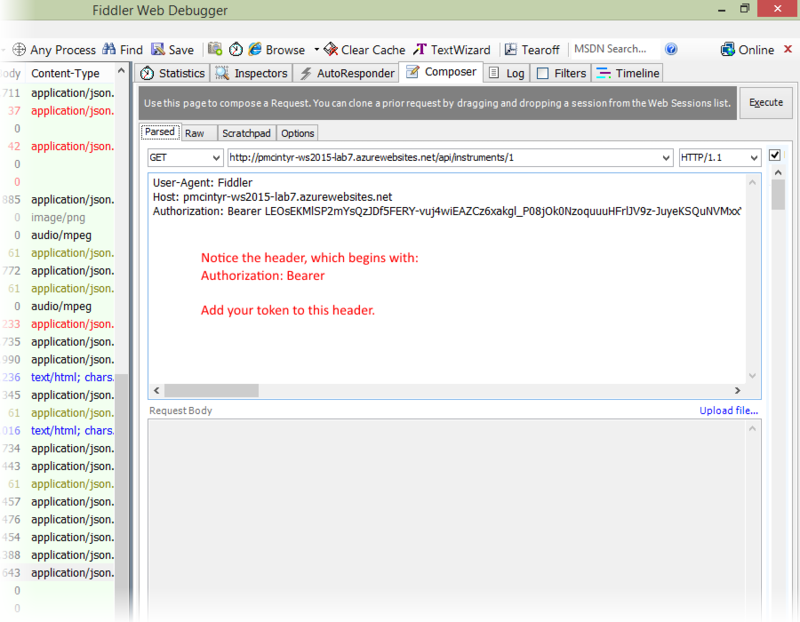 ASP.NET Identity also includes a token issuer. This component will handle requests to the “/token” endpoint. 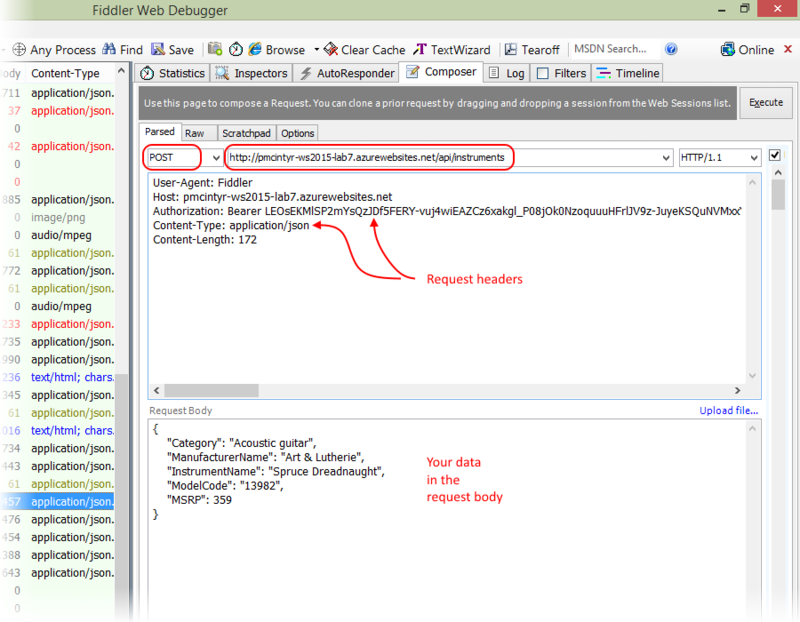 A requestor sends a POST request, with credentials, and the component creates and issues a token. The token is encrypted, using a server-configured or programmer-configured signature. Next, the token is encoded into a format that can be sent on the web. Finally, the token is delivered to the requestor. Finally, ASP.NET Identity includes an authorization module. When handling a request that includes a token, its work is split into two phases. In the first phase, the token is decoded. Then, it is decrypted, using a server-configured or programmer-configured signature. Next, it is validated, to ensure that it has not expired. In the second phase, a security principal object is created, and attached to the request thread. If the request is for a resource that requires authorization, the security principal object is inspected, and matched to the authorization specification. If it matches, the request proceeds. If not, an appropriate HTTP response can be returned. If unauthorized, what is the correct response? In our app design, a repository method will return an object or collection, or null. So, if the repository method detects an unauthorized state, what can it return? Its only choice is null. Otherwise, you must add more logic to the controller method, to detect, filter, and respond appropriately (or create a message handler or filter, a topic beyond the scope of this course). It could be argued that returning 401 or 403 would “leak” information, by implying that a resource exists, but we do not have access to it. Interesting, yes? In summary, returning 404 in the controller response is probably OK.
Can we separate these components? In Lab 7, the Identity Server project does the first two tasks. The Instruments project does the third task. When you are working with a separated apps (Identity Server and Instruments), each app’s project is loaded in Visual Studio. That means you have two instances of Visual Studio running. Then, you run/execute the apps. Each will be configured on its own customized TCP port, and run on your computer’s IIS Express developer web server. Interact with your apps using Fiddler. When you are developing your separated projects, you are also testing them on your localhost instance of the IIS Express web server. As a result, both projects are running on the same computer. What this means is that the token issuer – the Identity Server app on your computer – is using the computer’s digital certificate to sign (encrypt) the token. Then, the token validator – the Instruments app on your computer – is using the same digital certificate to decrypt the token. When you deploy the Identity Server app and the Instruments app to Azure, they will likely end up being deployed to different computers (or virtual machines). What will happen then? Your separated projects will not work. Why? The digital certificates will not match. How can this be fixed? By generating a custom “machine key”, and saving it with each app that participates in a shared security environment. Then, add this as the last entry in the system.web section of the app’s Web.config. Do this for BOTH the Identity Server app and the Instruments app. Test on your local machine, before deploying to Azure. In the sections that follow, a number of very important security definitions and terms are presented. Read, study, and understand. If you have questions, ask. We’ll use some of these this week, and continue using them next week. An actor – or a user, or a requestor – is an entity that will interact with the web service. Can also be a programmed component in the web service itself. 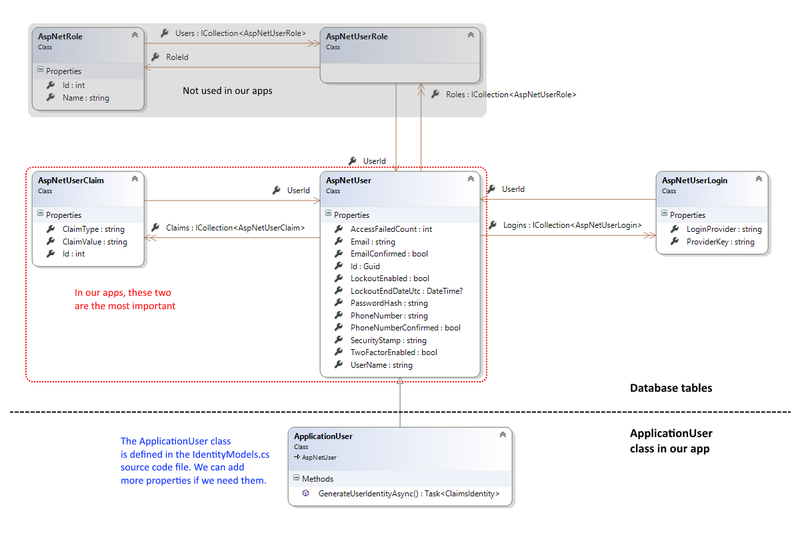 For example, an exception logger (which creates persistent objects). Can also be a third-party programmed component, external to the web service. For example, an iPhone app. In a security context, an account is an object that represents the identity of an actor (user, requestor). The object includes credentials, which minimally consists of an identifier, and a secret that’s shared between the actor and the identity management service. An account or identity management service is a programmed component that stores and enables the management of accounts. It also performs authentication. In simple apps – for example, the web apps you created in your second-year web app programming course – the identity server is embedded in the app. Soon, you will learn to separate (or decouple) the identity management service from an app. This will enable you to create distinct apps that can use the services offered by a shared identity server. Account registration is the process of requesting an account from the identity management service, using a registration process. Almost always, a human is involved in the request. A human will always be involved if the account is for a human. If the account is for a third-party programmed component, then it is typical that the human that is responsible for the component performs the registration task. Authentication is the process of validating the credentials of an account. It is a task that’s done by the identity management service. 1. In an app that includes an embedded identity management service, a security principal object is attached to the execution context. 2. In a web app with a browser interface, result #1 above happens. In addition, an HTTP cookie is generated, and returned in the response. 3. In a web service, result #1 above happens. In addition, an access token is generated, and returned in the response. It can be inspected by your program code, so that you have decision-making information in your code path. A digital asset on the web. Identified by a URI. Available in a predetermined representation, and/or in a negotiated representation. A resource owner is the “owner” (or originator, creator) of a digital asset. Logically, an actor (user, requestor). Outside of an execution context, a resource owner is an account. While code is executing, a resource owner is the security principal. A resource server enables access to resources. A resource server trusts an identity server. NOT a human. NOT a user. Super important to understand this.